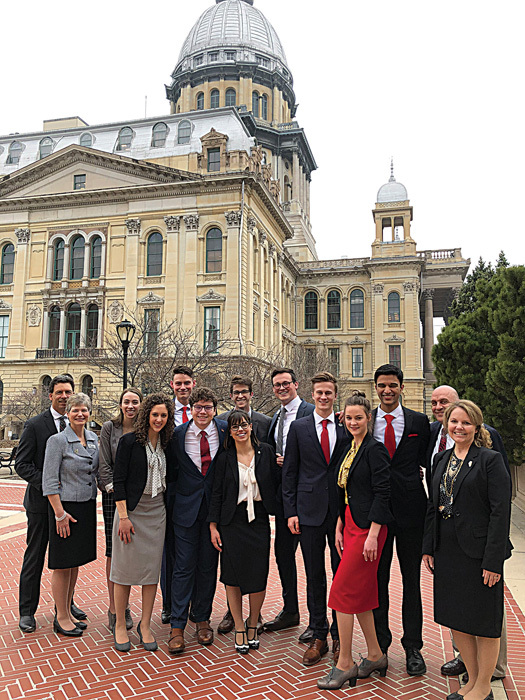 On March 25, over 80 high school students from across Illinois gathered for a week at the state capitol with the national program known as TeenPact. TeenPact’s goal is to “inspire youth in their relationship with Christ and train them to understand the political process, value their liberty, defend the Christian faith, and engage the culture at a time in their lives when, typically, they do not care about such things” (www.teenpact.com). That is exactly what they have been doing in Illinois and in classes across the country for 25 years. Excitement was in the air as students arrived at the capitol building Monday morning. The students and peer leaders anticipated a week full of new experiences, leadership opportunities, and chances to step outside their comfort zone – over and over again. The week began with the students being divided into legislative committees where they had the chance to run for chairman or clerk of their committee. The elected leaders then led their fellow students in reading, discussing and voting on bills through the week – all while practicing parliamentary procedure. Had you been a fly on the wall, you could have heard one 7th grader say to the current speaker, “Will the gentleman in the well please yield the well for the purpose of moving the previous question?” To which the speaker responded, “I will.” The chair would further recognize the 7th grader, who would respond, “I move the previous question,” to which the body called, “second.” All that, and more. Through the week, they moved through multiple mock bills, addressing issues such as term limits, education funding, gun rights, voting reform and more. Each day of class began with students participating in their first amendment right – the freedom of worship. After singing and hearing a devotional from a staffer, the committees went on prayer walks in the capital where they prayed for the executive, legislative and judicial branches of government, plus the military – seeking God’s protection for the men and women defending our nation, His wisdom and guidance for the politicians currently in office, and that He would raise up strong and principled individuals to lead our state and nation going forward. For many students, the highlight of the week was class elections. After learning about the political process in the United States, students were divided into parties where they were given an issue and created a party stance – such as the “Multi Capitals Party,” a stance to reduce income taxes and deregulate businesses in an effort to combat the population loss in Illinois. Students were nominated by their party to run for senator and governor. Those who made it out of primaries chose speechwriters, campaign managers and a team to make signs, garner votes and promote their platform. Candidates went to the general election the next day and participated in open forum where they answered questions in front of the entire student body. Comfort zones? Well, by this point of the week, comfort zones were long gone. Students were on an all-time energy high as they conducted their campaigns with charisma and confidence. The election closed with students casting their ballots, followed by a highly hyped announcement of the winners. In addition to these activities, students heard speeches from, and asked questions to, State Senator Dan McConchie, and State Representative Tom Morrison. All through the week, TeenPact challenged the students to excel in true leadership by digging deeper into God’s word, pursuing whatever calling God has for them, and growing in their relationship with Christ. The staff team for the week (pictured) was formed of a trained peer group, consistent with TeenPact’s peer leadership model – a model formed around the belief in the capacity of young people to take responsibility, set an excellent example, and be a good leader by first being a servant; it’s a model that challenges the status quo in our culture today. Under this model and method, state classes continue around the nation, as they have for 25 years, led by outstanding teens. These teens who are committed to serve because they want to be a part of changing lives, and forging one strong leader at a time. Through every life that is changed, the world is changed; this is consistent with the TeenPact motto: “Changing lives to change the world – through intentional discipleship.” In closing, thanks to TeenPact for bringing another wonderful state class to central Illinois. For more information, visit www.TeenPact.com.